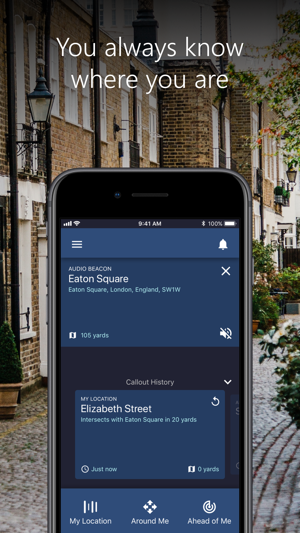 - As you walk, Soundscape will automatically call out the key points of interest, roads and intersections that you pass. These can be adjusted and turned on and off. 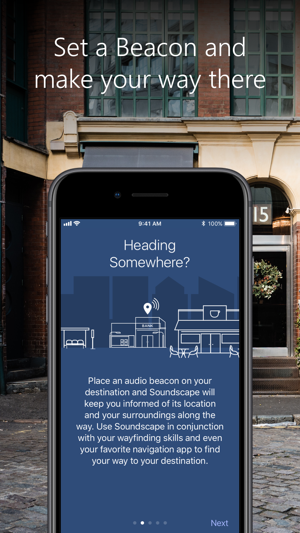 - An audio beacon can be placed on a point of interest, and you will hear it as you move around. 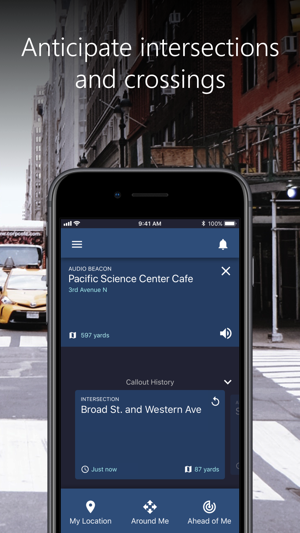 You can place an audio beacon on a point of interest that you would like to track such as your destination, a point to return to or a landmark you are familiar with. 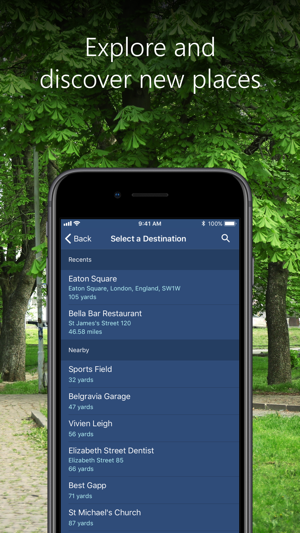 - “My Location” describes your current location and the direction you are facing. 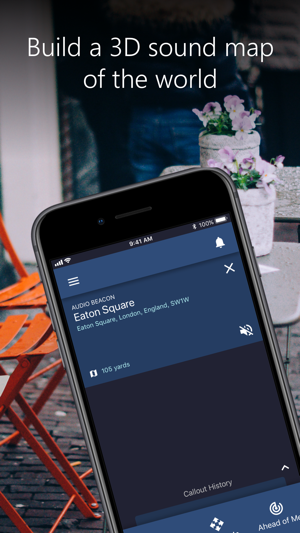 - "Nearby Markers" describes nearby places you have marked. - “Around Me” describes nearby points of interest in each of the four cardinal directions, helping with orientation. Try this out when getting off a bus or leaving a train station. - “Ahead of Me” describes points of interest in front of you, for example when walking down the street. - The expandable Callout History section lets you review callouts you have heard, repeat callouts, hear more information about them, and more. We hope you enjoy the experience. We believe that this kind of technology offers a new way to relate to the environment around you and we can’t wait to hear what you make of it. If at any time you have any questions about Soundscape, please refer to the Help & Tutorials section available on the main menu or if you require further help then you can contact the Disability Answer Desk on 1-800-936-5900 which is a free of charge service. This version contains a series of bug fixes based on user feedback. As always, let us know if you have any feedback! Been looking for this sort of app for ages!!! As a totally blind person naviggating around my community with a white cain, this app has stopped me from becoming totally disorientated. It is a must have app for me. Requires iOS 11.4 or later. Compatible with iPhone, iPad Air Wi-Fi + Cellular, iPad mini 2 Wi-Fi + Cellular, iPad Air 2 Wi-Fi + Cellular, iPad mini 3 Wi-Fi + Cellular, iPad mini 4 Wi-Fi + Cellular, 12.9-inch iPad Pro Wi-Fi + Cellular, 9.7-inch iPad Pro Wi-Fi + Cellular, iPad Wi-Fi + Cellular (5th generation), 12.9-inch iPad Pro Wi‑Fi + Cellular (2nd generation), 10.5-inch iPad Pro Wi‑Fi + Cellular, iPad Wi-Fi + Cellular (6th generation), iPad Pro (11-inch)Wi-Fi + Cellular, iPad Pro (12.9-inch) (3rd generation) Wi-Fi + Cellular, iPad mini (5th generation) Wi-Fi + Cellular, and iPad Air (3rd generation) Wi-Fi + Cellular.